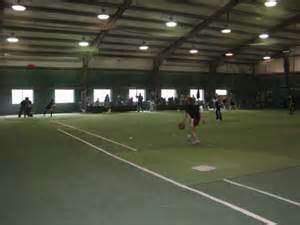 Indoor Baseball Drills, although possibly not as preferred as the outdoor environment, can still be quite beneficial if they’re well planned, and besides that, nothing deflates a team, anxious and biting at the bit to begin, than canceled baseball practices due to weather conditions. Let’s learn some basic indoor drills which can be informative and fun as you build your team’s skill level. Being forced inside can have its advantages, because of the lack of field area, the players are in closer proximity to the coach, which provides an unrushed, good teaching environment. There’s no better time to teach the basic mechanics of how to field a ground ball. 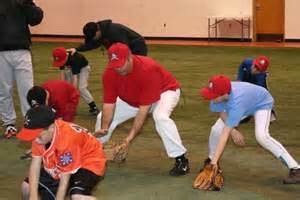 Have the team form a semi-circle in front of you while you demonstrate the proper form of fielding a ground ball. (a.) Glove on the ground…. (b.) Knees bent staying low …. (c.) Both hands out in front of you …. (d.) Eyes directly on the ball all the way into the glove. Throw ground balls to each player, stopping and correcting any mistakes in form or mechanics. One of the best methods of building arm strength and proper upper body mechanics for throwing, is to eliminate the lower body from the equation. (a.) Divide the team into pairs …. (b.) Begin the throwing distance at @ 20 feet, then increase as the drill continues. (c.) Have each player throw while kneeling on 1 knee, a variation is to require both knees, and have them play catch. This drill teaches the player how to become square to his target, use only the upper half of his body and strengthen arm and shoulder muscles. For this drill divide the team in half, positioning them facing each other spaced at least 40’ apart, using their regular glove and throwing an age appropriate regulation size baseball. If a player is strictly a catcher and wants to use his catchers mitt, that’s fine. If he can speed catch and throw with a mitt, he can with a glove. The coach starts the drill by yelling “Start” , “Go” or by blowing a whistle. Within a minute, the players are to catch and return throw as quickly as possible, accuracy being important, but increasing speed being the ultimate goal. After completing the cycle, have one side of the team shift to the left or right, making a new pair of players, performing the drill as long as you deem necessary or until everyone has had a different partner and is now back with their original partner. Throwing, or Bull Pen practice as it’s sometimes called, besides being easily performed inside, can actually be more beneficial than being outside throwing should the weather be too cool or damp. (a.) Monitor your pitchers and demand they complete a stretching routine before any throwing begins, as this is imperative in preventing injuries. B.) Have your pitchers work on mastering location, then learning different pitches, being careful they don’t overthrow the number of breaking pitches. C.) Encourage communication between the catcher and pitcher as they practice, which develops a bond between the two, and allows the catcher to become familiar with a pitcher’s tendencies and abilities. Define areas where the pitching is restricted and if need be place a spotter to protect them from an errant throw from another drill area. Players of all ages need to be reminded to Run Through First base when trying to beat out a hit, teaching younger players they do not slow down as they approach first base, nor do they hop or try to time their steps to hop onto the base. (a.) Have each player stand at the plate assuming their batting stance, then either imaginarily swing, or using a bat swing, and begin their run to first…. (b.) It’s important to use the motions of swinging, in order to assimilate real life actions…..
(c.) Stress this exercise is a drill to increase speed from home to first base. 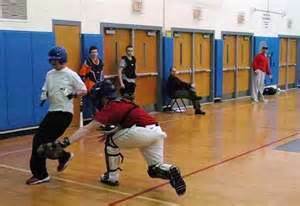 With the use of a few basic training aids, a catcher can practice his mechanics of Blocking Wild Pitches. (b.) Throw balls in front of the plate simulating a wild pitch…. 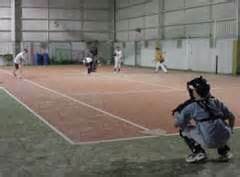 Indoor practice is a great chance for that specialized one on one hitting coaching, and can be accomplished in one of three methods. (b.) While seated on a bucket or knee, on the opposite side of the plate, toss balls into the air over the plate and have the batter hit them …. (c.) Use a pitching machine to give BP….